I have no room to complain about the abundance of veggies we are getting from our garden this year, especially since last year was a total wash. The only thing that I might say is that when life has you going a hundred different directions, your garden doesn’t wait for you to catch up; it just keeps growing. The vegetable drawers in my fridge are packed full of zucchini and cucumbers. And now our jalapeno peppers are coming on strong. Yes, it’s time to make homemade pepper jelly. My mother was a domestic wonder woman, and truthfully I think she enjoyed it just as I do. She made it all look so easy and I know that isn’t always the case. My daughter just bummed homemade strawberry freezer jam from me (just as I did my mom), and she even asked if we could make my mom’s recipe for homemade spaghetti sauce (together) this year. Could it be that she looks at me as a domestic wonder woman too? She does tell me that I make blue ribbon deviled eggs and that makes me laugh every time she say’s it. Of all the things to be admired for, it all boils down to eggs? No pun intended. Today, I want to share one of my mom’s recipes with you. This is my favorite refrigerator pickle recipe. You won’t believe how easy they are to make, and if you like sweet pickles, you won’t be able to stay out of them. 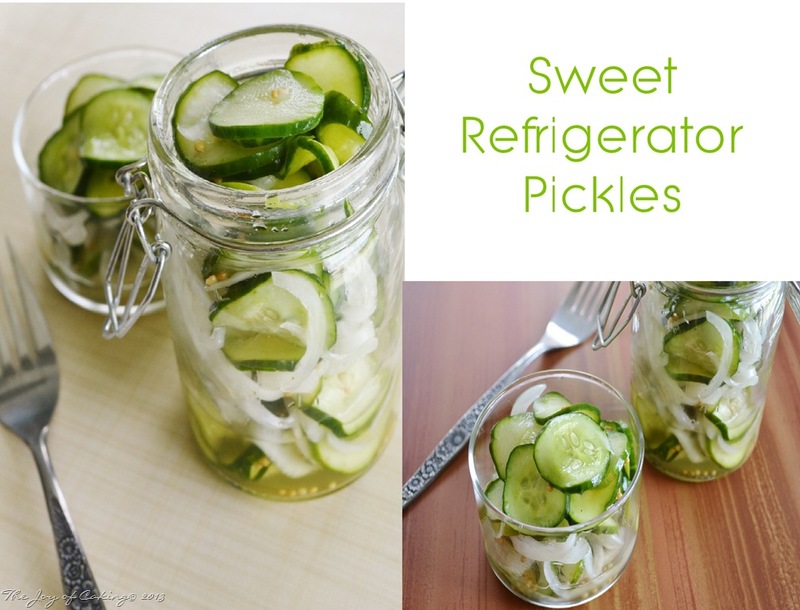 They are not overly sweet in my opinion, and they are super crunchy for a refrigerator pickle – yum! In a large bowl, place cucumbers, onion, and salt. cover with cold water and let stand 2 hours. Mix all ingredients well; cover and place in fridge. Stir a couple times a day for a day or so. These pickles keep in the fridge for several weeks. 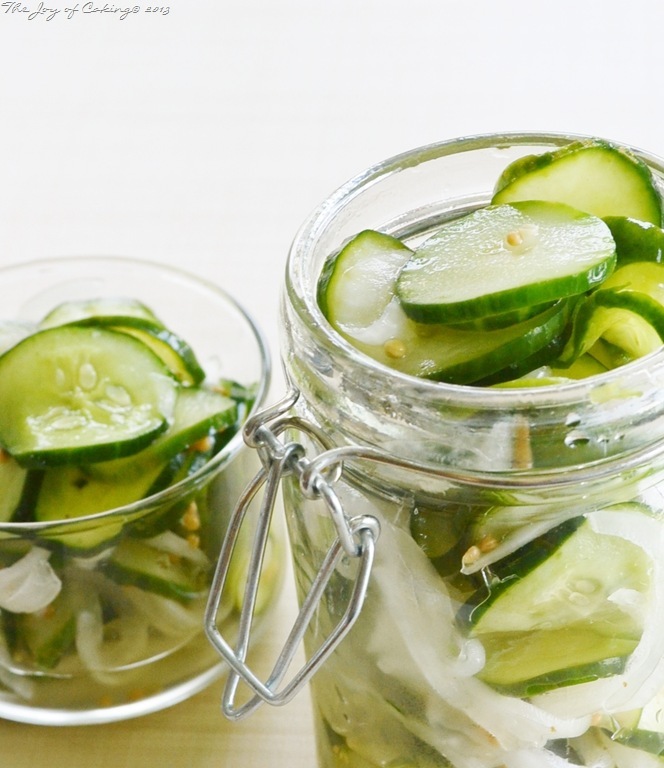 These pickles make a great snack, go great with a hearty sandwich, and are delicious with hamburgers or pulled pork sandwiches too. So, are you a sweet or dill pickle fan? Made these pickles yesterday and almost one jar is gone already! They’re a hit! Thank you! So glad they are a hit! I can’t leave them alone either -lol! I just made dill pickles for hubby and I actually like them too. I will share the recipe soon. Linda, You just rinse and drain pickles with water and then use 1.5 cups of vinegar for the brine. If it looks like you have too many cucumbers I would make another half batch of brine. I didn’t have a ratio issue other than bumping up vinegar by a half cup. These pickles don’t swim in the brine like canned pickles. Hope this helps. I’m usually not big on pickled food, but yours look so tasty! If I were to like anything pickled, it would have to be sweet so I think I will give this recipe a try 🙂 Thanks for sharing! 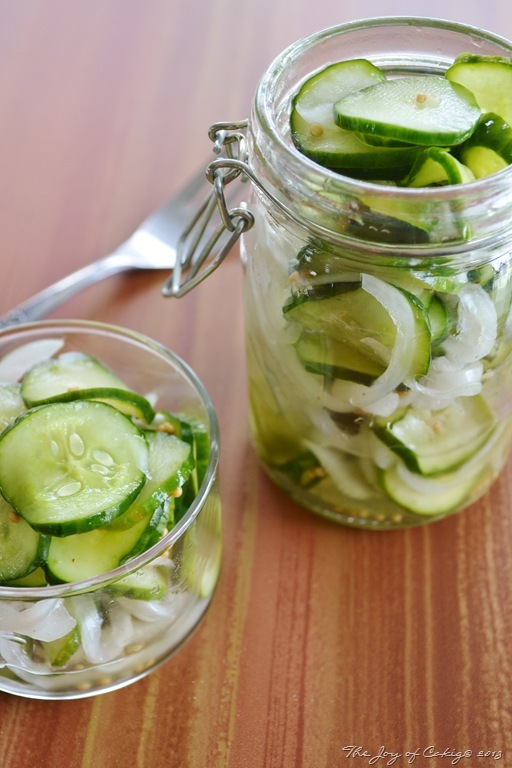 my mom always made as a child..i’ve yet to pickle..your recipe sounds great. I shall try! Love to hear how they turn out for you! Oh, now I have got to try this, Eileen! What a great idea, and so easy, too! Thanks for sharing. Amy, I promise this is the easiest recipe for pickles you are ever going to find. Go for it! I love sweet pickles. I developed a serious craving for them during pregnancy…and it has continued after delivery. Thank you for sharing your mom’s recipe with us. I’ll be making this soon! I have recently fallen in love with bread and butter pickles. Where have they been all my life!? I have to try this! I was surprised by the amount of sugar, but if you say it’s good, I’ll take your word for it. The photos are great, btw! Yum! I love both dill and sweet pickles. I’m that person who buys the giant sour pickles from the gallon jars at ballgames & fairs, too. Love them! My family makes salty refrigerator pickles each summer by combining cucumber slices, green onions, apple cider vinegar & water, salt & cracked black pepper. The longer they sit in the fridge, the better they get. It’s always a sign that summer is here. Hi Eileen! I love cucumbers! the idea is great! I love the Design and the content of your blog it is truly inspiring! Thank you!